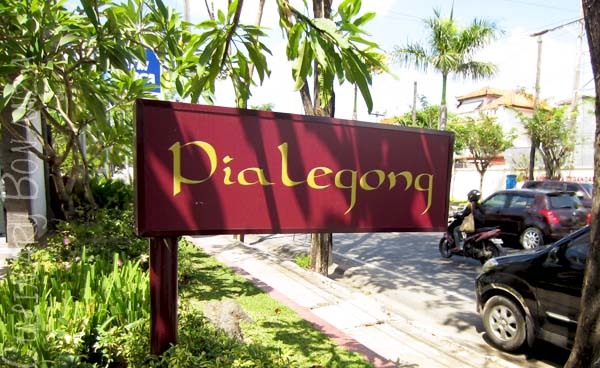 If you visit Bali and feel like presenting your folks back home with something more special than the ubuquitous beer singlets or hardly functional souvenirs, why not treat them to Bali's Pia Legong, Bali's famous traditional pie. While rumour has it that one should reserve their orders days (some even said weeks!) in advance, I was quite lucky to be able to walk-in to the store at Bypass Ngurah Rai and managed to bring home myself 2 boxes of mixed variants. When I went, it was during low season, the situation might be different during peak-season. As I entered the minimalistic and less-than-grand store (you won't see any display racks / price list / menu here), there was a bit of a queue, but the staff were efficient so we didn't wait long. The only reference you could get is either asking the (hopefully) more experienced shopper in front or behind you or just gaze at the framed display hung on the wall. 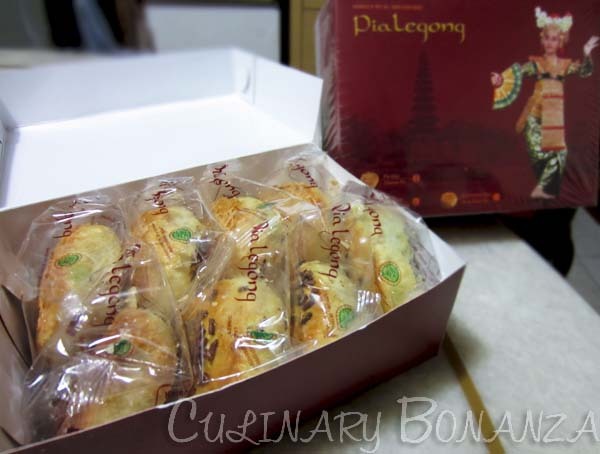 Pia Legong ONLY comes in 3 flavours: chocolate, sweet cheese & mung bean and they charge a premium price. If you purchase directly at the outlet, it costs IDR 70,000 /box containing 8 individual packets. If purchased at shopping malls / elsewhere, some said it may fetch up to >IDR 100,000. You may wonder why would anyone buy it other than at the official outlet? Refer back to my 3rd paragraph, customers are required to reserve in advance, which is not possible for everyone, especially if you've only heard of Pia Legong when you set foot in Bali. So, some entrepeneurial minds helped to solve this problem by unofficially "distributing" these pias, at a profit of course. Back in Jakarta, I was impatient to wait for the next day and immediately tore open one box to try it out. Upon opening the plastic wrapper, the buttery scent smelled so rich and inviting! As I cut the pia right across the middle, the rich chocolate filling oozed out rightaway. Unlike many other chocolate pia I've had from elsewhere, the chocolate is not the dense / crumbly type. The pastry/skin is noticeably more oily than average, but it was still crispy. Then I tried the cheese flavour, the texture is rather granulated, could be from the sugar added. 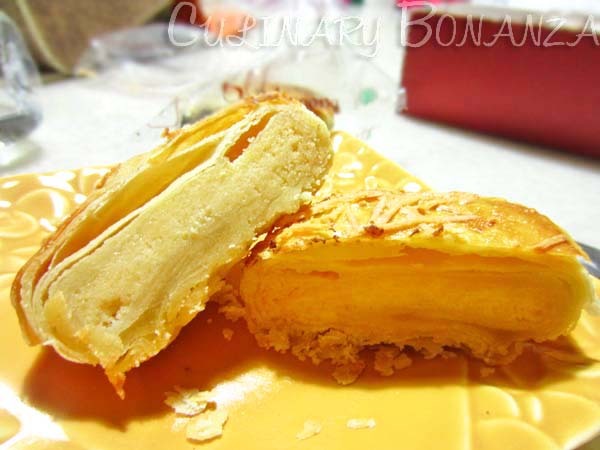 So don't expect the chewy / cheddar-y type of cheese filling. Some like the cheese better as it's not as sweet as the chocolate flavour. 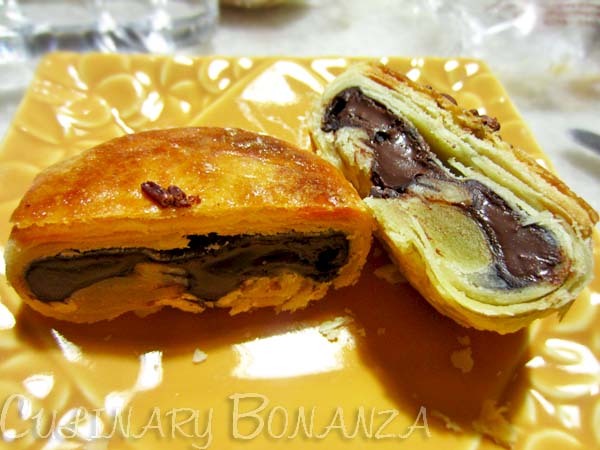 I personally love the chocolate pia. v Payment methods accepted: cash / Visa / Mastercard, debit BCA. Love: P the chocolate pia P practical packaging P efficient staff. Dislike: K the price K weeks in advance reservation rule K only 1 official outlet in the entire world. tapi owner dan pelayannya jutek sekali..
setau aku kalo mau dapet ga pake pesen bisa kok..